Clusters are mainly used to overcome capacity shortages so your IT services stay in line with your service level agreements. Get alerts on impacted PowerHA components that are vital to your business. Prevent business losses by upfront actions on impacted systems. Working with System Center Operations Manager (SCOM) makes it easier for IT professionals to monitor the health and performance of your computer systems, but there is still a missing puzzle piece to complete the single interface view of SCOM, which facilitates the monitoring of databases, middleware and applications. The NiCE PowerHA Management Pack (NiCE PowerHA MP) for SCOM is one of the pieces that you need as you work with System Center. It extends the view of SCOM to give you the holistic picture of servers & systems, and thus complete the enterprise scope for the administrator. The sophisticated and intelligent Enterprise Ready management pack fully integrates into Microsoft SCOM and continuously monitors the PowerHA (HACMP) infrastructure, identifying server problems before they affect applications and end users. The management pack collects the detailed data that you need from your PowerHA environment using predefined event conditions and threshold monitors. It helps you to increase the IBM PowerHA (HACMP) server availability and performance and to lower the overall cost of maintaining your PowerHA (HACMP) environment. It enables you to perform service-oriented management as well as incident management in your PowerHA environment, while supporting your business critical processes. NiCE management packs integrate seamlessly with SCOM. The PowerHA MP has an easy to deploy architecture that does not require additional servers, proxies, or appliances to be installed. IBM PowerHA consists of numerous objects like Nodes, Resources, Resource groups and AIX computers. Each object has its own properties like startup policies, service labels, logpaths and identifiers. In a large environment, oversight of important components is easily lost. The ‘out-of-the-box discover’ allows discovery of all PowerHA objects including an extensive list of properties for each object. Utilizing the OpsMgr class model, a full PowerHA inventory model is mapped out. With integrations to SC Service Manager this valuable information is also available with Microsoft System Center Service Manager. Incidents impacting high-available infrastructure components must be processed with high urgency. For this reason, the NiCE PowerHA MP includes a number of monitors and alert rules to provide immediate, comprehensive information on impacted components within your PowerHA environment. The NiCE PowerHA MP includes monitoring of 10 different cluster availability states including ‘joining’, ‘barrier’, ‘cbarrier’ and many others. Additionally, if an incorrect configuration is applied to a cluster, the NiCE PowerHA MP has the capability to raise the correct alert instead. The detailed information given by the NiCE PowerHA MP drastically helps to understand issues and to reduce the mean time to recover. We understand that in an environment of ever increasing business demands, critical applications need to be available 24/7, with a fault tolerant system. However, fault tolerant systems are not cost effective. As such, there is a business need for a cost effective application which provides this functionality. In the case of a resource group experiencing a service incident, e.g. a node failure, the cluster manager acts upon the failover policies and initiates a failover of resource groups to another available node (as an example of what is possible). 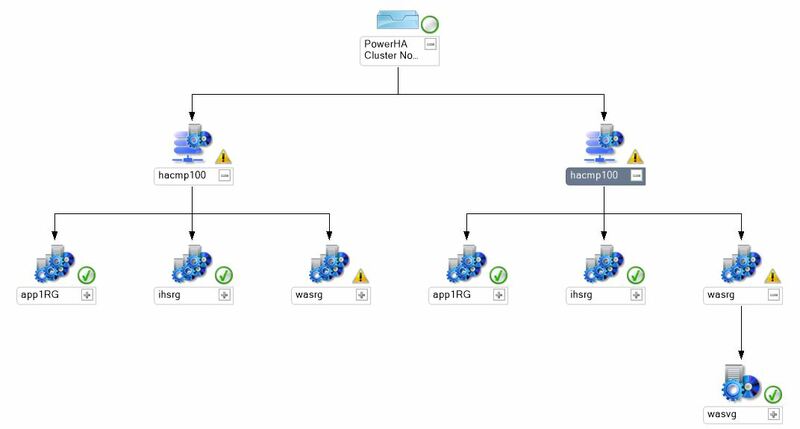 Failover detection rules will evaluate relevant entries in the cluster log as well as use cluster utilities to inform one about the events that occurred during failover. PowerHA Resource Groups contain critical resources of a cluster, typically interfaces and mount points. If a resource group fails or becomes unavailable, resources are impacted. In order to be on top of all the resource group impacting events, the NiCE PowerHA MP includes several monitors dedicated to resource and resource group monitoring. Furthermore, the MP complements the monitoring provided by the Microsoft AIX management packs. Manage your entire IBM PowerHA (HACMP) environment from a single point of reference. Currently there are no integrations for the NiCE PowerHA MP.